Alvin and the Chipmunks: The Squeakquel is a 2009 American live-action/CGI comedy film and sequel to Alvin and the Chipmunks starring Zachary Levi, David Cross, Wendie Malick, and Jason Lee. The film also stars the voices of Justin Long, Matthew Gray Gubler, Jesse McCartney, Christina Applegate, Anna Faris, and Amy Poehler. 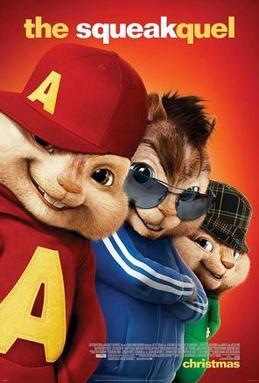 The film features Alvin and the Chipmunks and their female counterparts, The Chipettes. It was directed by Betty Thomas, written by Jon Vitti and Jonathan Aibel & Glenn Berger, and distributed by 20th Century Fox, and produced by Regency Enterprises and Bagdasarian Productions. It was originally scheduled to open on March 19, 2010, then on December 25, 2009, but it was moved up to a December 23, 2009 release instead.